Christmas is the perfect time for baking sugar free cookies. It makes a great activity to do with all the family and the biscuits are ideal to have around in case anyone pops in during the festive season. Some sugar free cookies also make great Christmas gifts. Make them larger and present them in an individual box or make lots of little ones and wrap them up together.Some cookies can also be used as Christmas decorations. Bake them with a hole in top, thread a ribbon through and then hang them on the tree. 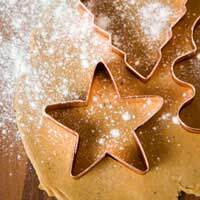 For this recipe you will require a star-shaped cutter. These are easy to find in a kitchen shop or department store and come in a variety of sizes. Preheat your oven to 180 deg C/350 deg F/gas mark four. In a small pan, melt your honey and margarine. Remove from the heat and leave to cool. In a separate bowl or cup, beat your egg then stir in. Add your vanilla essence. Sieve your flour and all spice into a bowl, then pour in your liquid. Stir until you have a dough. Roll into a large ball, wrap in cling film and place in the fridge to chill for about an hour. Lightly dust a clean surface with flour and roll out your dough to about one cm thick. Cut into star shapes and position on a greased baking sheet. Bake in the centre of the oven for just 10 minutes, then remove and leave to cool. Sprinkle with a little more ground allspice. For these cookies you’ll need some Christmas cutters. Again, by looking around in the shops you should easily find cutters in the shape of Christmas puddings, reindeer, Father Christmas and stockings etc. You will also need a ball of thin red or green ribbon. Your star cutter can be used again and if you have a square cutter you can use this to make present shapes.You will also need an icing piper. Lightly dust a clean surface with flour and roll out your dough to about one cm thick. Cut into various shapes and using the end of a wooden spoon make a large hole in the top of each cookie. Position on a greased baking sheet. Bake in the centre of the oven for just 10 minutes, then remove and leave to cool. Melt your chocolate and fill your piper. Decorate your biscuits with the melted chocolate. If you have plain square shapes, use the chocolate to make ribbons to transform them into presents. Leave the chocolate to harden. Cut a six cm length of ribbon for each cookie and thread through the hole in the top. Tie up and trim the ends. Your cookies are now ready to be hung on your tree.